This is the second Hainan Airlines service from Mainland China to Ireland – with Hainan already operating a service from Beijing since last year – and will help to significantly boost visitor numbers from China to Ireland this year. Tourism Ireland is working closely with Hainan Airlines this spring, to highlight the island of Ireland and drive demand for the new service. Activity will include Ireland ads running on popular social platforms, as well as on the Hainan Airlines website, around St Patrick’s Day. 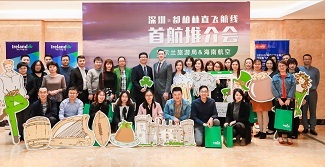 As part of the seminar, the travel agents in Shenzhen learned about Dublin and Belfast, the Wild Atlantic Way and Causeway Coastal Route, as well as filming locations used in Game of Thrones and Star Wars. Tourism Ireland also highlighted the convenience of the British Irish Visa Scheme, which allows Chinese nationals to visit both Ireland and the UK, including Northern Ireland, using a single visa.